Discussion in 'Engine & Transmission' started by dan_b, Apr 17, 2009.
now i see on here the has bein many post's on the empi style. i like a look of t=that and not to fussed if it rusts, mne is like it now and i dont always look under at it so im not fussed. i just dont wana waste the coin to have somthing that will rust out with'in a year. does any 1 have pics on how bad they rust? do these empi still keep the vw sound or they a bit louder? or should i just get a gen vw style 1.
i really like the vw sound. does it run any beter? once you paint them how long does it last b4 it wears off? Mate it definately runs better, i only painted mine a week ago and it still looks like it. some might say to paint pot belly black before you put it on. but i dissagree, better wait to that other paint burns of. otherwise your pot belly one will burn of with their paint. fair call, i was thinking of 200km runing in, blocking back then pot belly paint. does your rear bumper get any cooler? still has a kombi sound? Dan, if you pm dingostrategy he has the empi twins to sell, 2nd hand. I heard them over the weekend and they sound HOT! Still retain the dak dak but has a nice low burble as well. 200 ks will definately burn that other paint off. i did mine in about 150 k drive last weekend. jon were dingos one black or rusty or chrome looking. Black mufflers with chrome tips but I do believe they had been recently re-re-sprayed. They are the empi twin, I know that for a fact. Under the radar for a few days then will re surface in New Delhi next week. My old my new and after i painted them pot belly black, i didnt take a pic when they were rusty. ooooooooo they look good, beter than my rusty,holey 1. So what about the chrome twin empis? same paint problem? am thinking about ordering one but if theres heaps of re spraying all the time might go see someone about a custom full system headers and all. 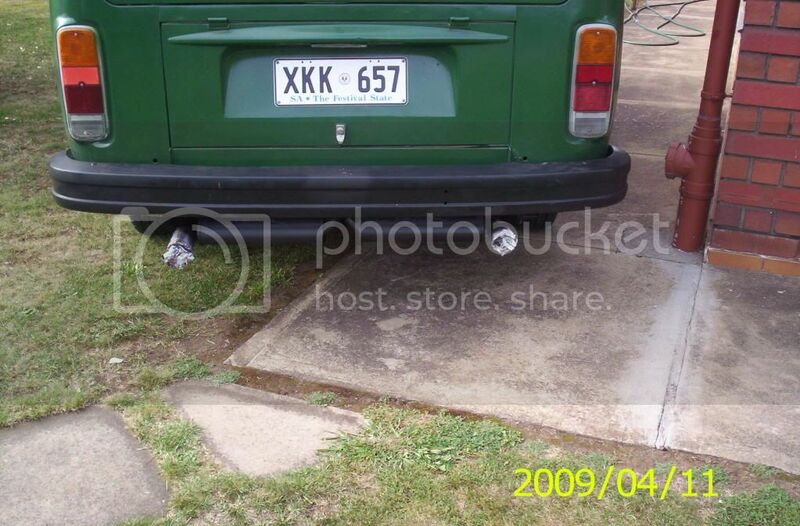 one other quick thing do you reckon its possible to make a kombi ehaust system out of a brand spanking new v8 commodore system (mate has a spare got bigger pipes on his) coz its just sitting in his backyard? and i got to thinking..... coz that would be loud! Not enough back pressure Cam. Unless you were to run the exhaust all the way up to the front then back again. Kombi engines love back pressure.